The Law Office of Mark D. Morrow- Currently Under Construction! “My firm is committed to representing individuals and families who have been the victims of a wrongful death or serious personal injury. We are knowledgeable legal professionals who are concerned and dedicated to providing the superior legal service to our clients. 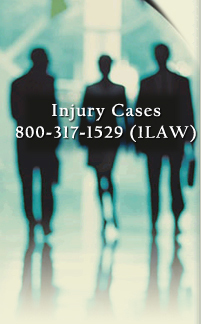 We understand how the harm caused by the negligent conduct of others affects our clients and their loved ones. We will strive to reduce the stress, trauma and hassles of seeking justice so that our clients may focus on their health and their families in their time of hardship. -- Mark D. Morrow, esq. Defendant-Sheriff was entitled to qualified immunity against plaintiff's constructive discharge claim where plaintiff failed to show that her work conditions would be intolerable to a reasonable person. In a limitation of liability proceeding, the district court correctly found that plaintiffs failed to fulfill the requirements for leave to file a late claim. An asbestos-related injury is not a "bodily injury by accident" under the parties' workers' compensation and liability insurance policies. In a personal injury action, the district court can properly exercise personal jurisdiction over Osama Bin Laden and al Qaeda where they engaged in unabashedly malignant actions directed at the United States and should therefore reasonably anticipate being haled into court by those injured as a result of those actions. West Virginia does not recognize a settling joint tortfeasor's right to sue another joint tortfeasor for contribution.